As my husband Clyde approached the taxi, the driver looked surprised to hear a gringo speaking Spanish. 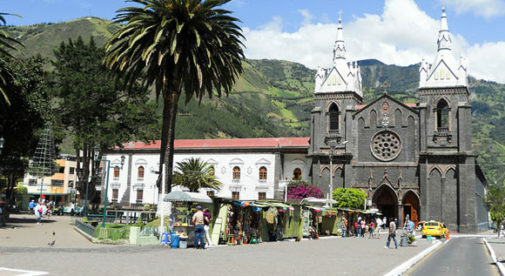 After all, this was the tourist town of Baños, Ecuador, which attracts visitors from all over the world. The streets are lined with little shops that display signs in English offering tours of the quaint little village. But we like to see things from a more authentic, and local, point of view. And there’s one travel tip we use everywhere we go that allows us to do that…and saves us money. Clyde asked the taxi driver what were his favorite things to see around the town. Confused by the question at first, the driver took a few seconds to gather his thoughts before he started talking. As the name “baños” means bath or bathroom in Spanish, the local thermal baths were a must-see, but we had already gone on a previous visit. Instead the driver told us about a route that goes by several beautiful waterfalls. Next Clyde inquired, “So how much to take us there?” The driver said, “$20.” The next four hours were magical as our driver proudly showed us snow-capped volcanos, majestic waterfalls with cable cars that soared overhead, and a natural rock formation in the side of a mountain that resembled Jesus. Along the way the driver mentioned a few more sights he could show us for an additional $20. He dropped us off on the edge of the road that lead up to a tree house overlooking the mountains. He napped in the taxi while we went to explore the mountain views. As our tour continued the more we smiled and seemed to enjoy what he was telling us, the more willing he became to go the extra mile. Not only did he act as our personal tour guide but he was also our photographer, advisor of where and what to eat, and our new local friend. And while our Spanish is far from perfect, this forced us to step out of our comfort zone and be willing to practice…and our driver was happy to slow down or explain things differently so we could understand. We love to try the local foods when we travel and taxi drivers are the best for suggesting cheap, local, and tasty eats. While in Ecuador we just had to try cuy, or guinea pig. A piece of guinea pig was served alongside three large boiled potatoes and we were each given a tablespoon to eat it with for $6. Hiring a local taxi as a guide can help you to have the most authentic experience when you travel. On a recent trip to Medellín, Colombia, we hired a local taxi tour guide for just $15. He drove us through tiny pueblos filled with colorful buildings where locals used horses as transport. We climbed up side roads that stopped at scenic mountain vistas overlooking the city below. Our driver also stopped at a roadside stand so we could sample fresh strawberries served with homemade whipped cream. For just $1.50, the vendor filled a large 24-ounce cup with the luscious cream and then added the berries. And while we were inside an antique store and bakery our driver picked up some fried dough balls called bunelos for us to try. The sights and tastes of travel create treasured memories that always leave us wanting for more. Finding a local taxi driver to take you on a tour of his town is an easy and inexpensive way to really gain an insight into the place we’re visiting. It gives us a chance to mingle with the locals and see things we might never have found on our own…and for us that’s a valuable part of the whole travel experience.